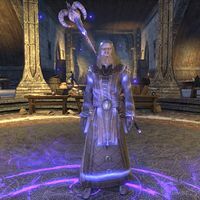 Shalidor is also credited for establishing a sanctuary for all mages across the ages on the island of Eyevea, an outlier island in the Summerset archipelago which he obtained from the High Elves in exchange for some minor artifacts. He bargained the island away to Sheogorath in exchange for the Folium Discognitum, a bargain which he later came to regret. His obsession to recover Eyevea from Sheogorath occupied him so much as to cost him the love of his wife, Ulfsild. ^ a b Urag gro-Shub's dialogue in Skyrim. This page was last modified on 28 December 2018, at 11:30.